October 11th was "I Love Yarn Day". Attempting to complete a sc lapghan passed along without specific pattern. 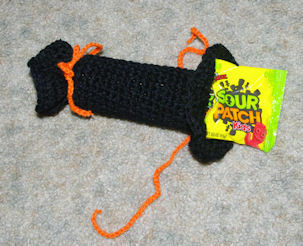 Unsure if original crocheter had one or was "designing." The rows have what can best be described as a - ridge. Peak of the ripple seem to have 2 sc's in a stitch of previous row. All stitches appear to be done in the back loop. Still when I work that stitch the row falls short of coming out as the other rows. Another curiosity for me, the edges of the lapghan are angled rather than aligned. Any ideas?? "Peaks" normally need at least 3 stitches and valleys must be decreased the same number of stitches for an even ripple. And Jesus came up and spoke to them, saying "All authority has been given to Me in heaven and on earth. Go therefore and make disciples of all the nations, baptizing them in the name of the Father and the Son and the Holy Spirit, teaching them to observe all that I commanded you; and lo, I am with you always, even to the end of the age." To these He also presented Himself alive, after His suffering, by many convincing proofs, appearing to them over a period of forty days, and speaking of the things concerning the kingdom of God. And gathering them together, He commanded them not to leave Jerusalem, but to wait for what the Father had promised. "Which," He said, "you heard of from Me; for John baptized with water, but you shall be baptized with the Holy Spirit not many days from now." And so when they had come together, they were asking Him, saying, "Lord, is it at this time You are restoring the kingdom to Israel?" He said to them, "It is not for you to know times or epochs which the Father has fixed by His own authority; but you shall receive power when the Holy Spirit has come upon you; and you shall be My witnesses both in Jerusalem, and in all Judea and Samaria, and even to the remotest part of the earth. And Cornelius said, "Four days ago to this hour, I was praying in my house during the ninth hour; and behold, a man stood before me in shining garments, and he said, 'Cornelius, your prayer has been heard and your alms have been remembered before God. Send therefore to Joppa and invite Simon, who is also called Peter, to come to you; he is staying at the house of Simon the tanner by the sea.' And so I sent to you immediately, and you have been kind enough to come. Now then, we are all here present before God to hear all that you have been commanded by the Lord." And opening his mouth, Peter said: "I most certainly understand now that God is not one to show partiality, but in every nation the man who fears Him and does what is right, is welcome to Him. The word which He sent to the sons of Israel, preaching peace through Jesus Christ (He is Lord of all)-- you yourselves know the thing which took place throughout all Judea, starting from Galilee, after the baptism which John proclaimed. You know of Jesus of Nazareth, how God anointed Him with the Holy Spirit and with power, and how He went about doing good, and healing all who were oppressed by the devil; for God was with Him. And we are witnesses of all the things He did both in the land of the Jews and in Jerusalem. And they also put Him to death by hanging Him on a cross. God raised Him up on the third day, and granted that He should become visible, not to all the people, but to witnesses who were chosen beforehand by God, that is, to us, who ate and drank with Him after He arose from the dead. And He ordered us to preach to the people, and solemnly to testify that this is the One who has been appointed by God as Judge of the living and the dead. Of Him all the prophets bear witness that through His name everyone who believes in Him receives forgiveness of sins." WHAT GOD HAS DONE FOR US." What are the following verses better known as? Cut several pieces of yarn approximately 12-14 inches long (you can experiment to get the length you want). Insert hook in the stitch. Fold all strands of yarn in half. Using the hook, draw the folded ends of the yarn up through the stitch and pull the loose ends through the folded end. 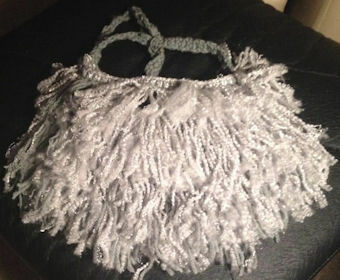 This completes a fringe and all you need to do is tighten up the knot by pulling on the strands of yarn. Continue with this method until you have added all of your fringe. You can trim the ends even with scissors after all fringes are added. 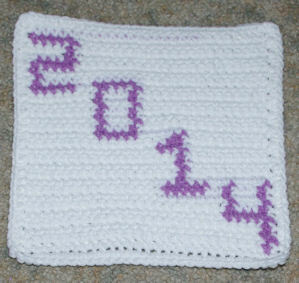 Crocheted ornaments, baby booties or other small crocheted items make great package toppers. I appreciated your ‘how to read a crochet pattern. The following was not indicated in your document. I understand everything except for ‘drop lp’ researched several sites & chrochet books, but can’t find drop loop. This is the beginning for making a 3 color spiral. Please help. To drop a loop, you simply remove it from the hook. This is normally done when making specialty stitches like popcorns. stitch holder in order to preserve the stitches until you pick it back up again. This pattern sounds very intriguing. mean when u read a crochet pattern? number of stitches you should have on that row or round when you finish it. This allows you to periodically check your work. Yes, I used a steel hook. All steel hooks are numbered and aluminum hooks are lettered. 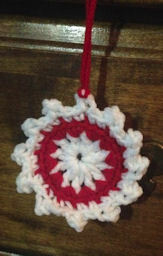 and although I don't want to make a tire cover, I would like to learn to crochet a pinwheel pattern. I have included the picture. 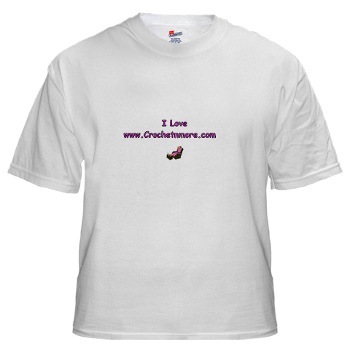 I refer any new crocheters to your website because your tutorials are so easy to follow. 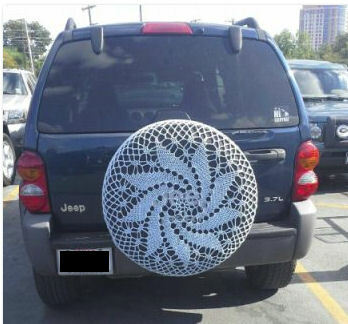 It’s similar to the design on the tire cover... which is beautiful. It is a solid crochet fabric. My work always came out sloppy because I﻿ didn't know where to put the marker. I like the flipping back and forth﻿ concept. I am a beginner and all the tips are brilliant. My pattern begins with the note : Join all rnds with sl st to first hdc. So, I've just finished 2nd. rnd as instructed with a slip stitch to first half double crochet..
Now, 3rd. rnd states: Sl st in next ch-1 sp. Ch 2. 2 hdc in same space as LAST sl st.
Is the Last sl st. the sl st I just made in the ch 1 sp? or is the LAST one the sl st I used to finish rnd 2? I'm a new crochter and this a free pattern for a beret from michael's. I also came across the same instructions in another pattern. It just doesn't seem to work if I go back to the last sl st in round 2 and yet I'm thrown off because if it is the sl st of round 3, why don't they say to do the hdc in the same ch 1 sp? their instructions down on paper. >>> Now, 3rd. rnd states: Sl st in next ch-1 sp. Ch 2. 2 hdc in same space as LAST sl st. This means you work a slip stitch in the next chain-1 sp. Then make 2 chains, then work 2 half doubles in the same chain-1 space. I am crocheting the cuff of a mitten which is all bl sl st. I have to chain 9 and then bl sl st starting in the second ch from hook. The next row is basically the same except I turn and ch 1 and then bl sl st and then continue this until I have the right measurement. It's all on top of one another and does not look right. I don't know what I am doing wrong. I have never done this kind of cuff before. It is suppose to make it stretchy. I do 3 or 4 rows and then I pull it all apart because it just doesn't look right. Working all of the slip stitches in the back loops will produce a narrow ribbing. instead of slip stitches. The ribbing will be wider but more distinguished. of yarn with a larger hook size . until you get the diameter you want. This would be trial and error, of course. Hallelujah! Finally a beginner tutorial that worked for me! I finally crochet'd my first baby beanie. Thank you so much! I just subscribed to your videos and will begin looking through﻿ your other tutorials. I need your help. I'm stuck on a section of my pattern. I'm making a hat from Red Heart called Judy's Hat. Round 13: With larger size hook, ch 6 (counts a first dc plus ch-3 sp), dc in next dc, (ch 3, dc in next dc) around, ch 3; join with slip st to first dc: 72 dc and 72 ch-3 sps. I would appreciate it if you could explain how or what I'm suppose to be doing with these rounds. These 6 chains will count as one double crochet which is 3 chains high.. plus a chain 3 space. Double crochet in the next double crochet. Repeat the instructions in the parentheses all the way around. the 3rd chain of the beginning chain 6. When you finish you should have 72 double crochets and 72 chain 3 spaces. Join with a slip stitch to the first double crochet. Thank you Lisa. I love the words of encouragement. Do you, by chance, have a video﻿ on how to join a color into the BLO of a stitch? The video link should come up in the results. To add a new color of yarn, work the last stitch of the old color up to the very last step of﻿ the stitch, then yarn over with the new color and complete that stitch. You can join new yarn in the front loop, back loop, both loops, etc. click here for the link to the video about back loops. into the beauty God intended for us to have of ourselves? some time on Sunday afternoon to write a letter to God. They were to bring back their letter the following Sunday. the neighborhood children anxiously waiting to play on it. while had the set completely assembled. without even reading the instructions." and when you can't read, you've got to think." about a dozen kids who live on our block. class... 33 children in all?" bursting with glee. I asked why he had done such a thing. "I always wanted a surprise party, Mom! Are you surprised?" asked my Mom, "Do you take this man to be your husband." And she said, "I do." to be your wife," and my Mom said, "He does." elevator, someone remarked on the elevator's inefficiency. elderly nun smiling at me. "You'll get that degree, dear,"
she whispered. "Perseverance is a virtue." "Do you think you are earning enough to support a family?" the older man asked the suitor. "Yes, sir," replied Jake, "I'm sure I am." Hospital regulations require a wheelchair for patients being discharged. However, while working as a student nurse, I found one elderly gentleman--already dressed and sitting on the bed with a suitcase at his feet—who insisted he didn't need my help to leave the hospital. cried out, "I caught you!" "You put that money back!" she said indignantly. "The tooth fairy left that for me!" Little Jonny thanked his grandmother for the set of drums she bought him for his birthday. "They're the best present I've ever had," he said. "They've already made me $10." "Not really," said the boy. "But Mom gave me $5 not to play during the day, and Dad gave me $5 not to play at night." "Davy, what noise does a cow make?" "Alice, what noise does a cat make?" who asks, "What's good tonight?" when I heard the dreaded question posed to my husband. He calmly replied, "Anything over $13.95."